Hi, everyone, and welcome to Mimi's Crafty Abyss. 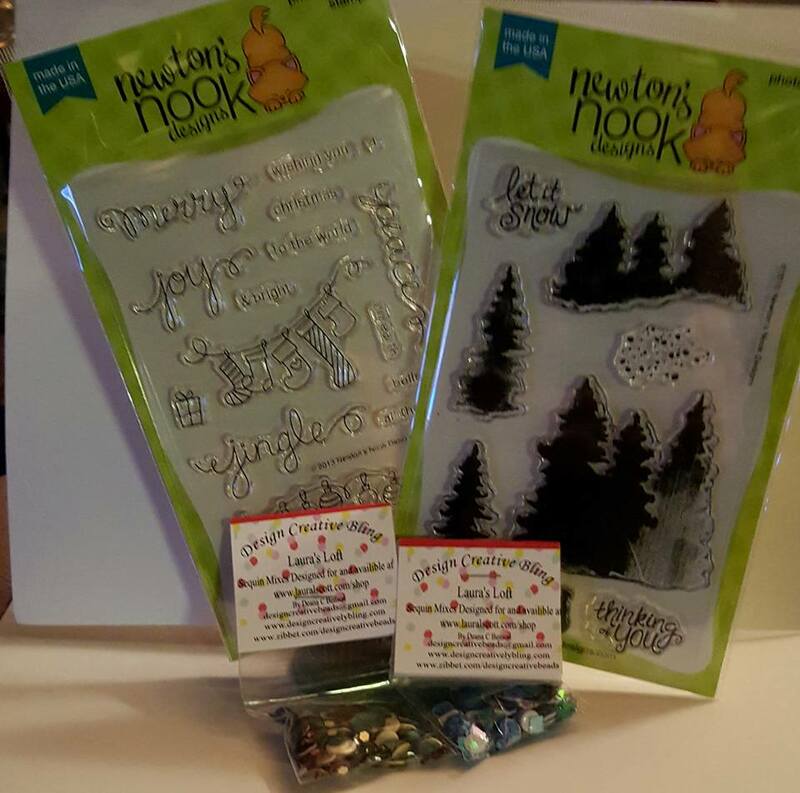 My post today is part of Laura's Loft December Ringing In The Holidays Shop and Hop. I am excited to be an inspirational compadre with all these wonderful, talented ladies at Laura's loft. You should have arrived here from Robbie's blog. If not you can go back by clicking the Previous Button or her name. First I want to say, we have a wonderful guest Designer this month, please make sure you take a few minutes and check out Jasmine's blog. So I sat here and did my complete post, and realized I had used that particular card for another post within the shop (had originally planned on using it for this hop) and last night realized it. SO, here is the new card for this hop. I had a lot of fun with this one, as I do with all of my fun cards. Using the Avery Elle "Snow Much Fun" stamp set for the Moose and Sentiment, Newton's Nook "Holiday Smooches" set for the Birds, and Newton's Nook "Fox Hollow" for the snow flakes I went to work. Using my Versamark pad I stamped out a few snowflakes on GinaK white cardstock. I heat embossed with WOW Clear Sparkle embossing powder. I then put a post it note in the middle of the card to mask out a section for the "Ice Rink". Using my distress inks in Peacock Feathers, Faded Jeans and Salty Ocean I colored the night sky. Used my heat tool to dry the ink. Removed the mask and used my Versamark pad to ink up the ice rink and used the WOW Sparkling Snow to add some shine to the ice. Heat tool again took care of that embossing. I then used my Silhouette Cameo to cut out the moose and birds, colored him with my Spectrum Noir markers and used WOW HOHOHO embossing powder on this cap and Skate Socks. I used my Tombow Mono to affix a few snowflakes dug out of the Baby It's Cold Sequin Mix, as well as the cute little snowman, which I used pop dots on. I hope you all have enjoyed my card as much as I enjoyed making it. Merry Christmas, Happy Hanukkah, Happy Festivus and any other holiday which you may choose to celebrate. All Christmas Stamps and Dies are 30%, no code needed prices will be changed. This will run from Dec. 3 until they sell out. After doing these 3 things you need to fill out the rafflecopter to be entered!! To get to the next artist on the hop just click on the button below. If you get lost, click on the names listed below. Have fun hopping and shopping!!! 4. LeeAnn McKinney YOU ARE HERE!!! 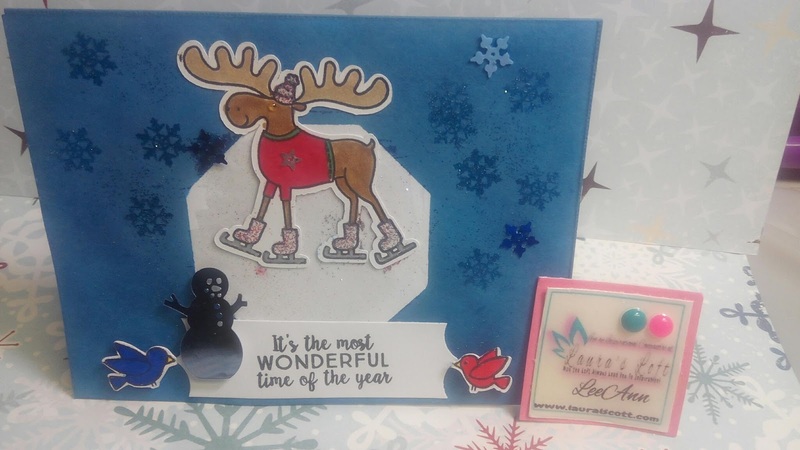 I love how you combined so many different stamp sets from so many different brands and they work just perfectly together.-Heather C.
That is the cutest moose! I love his boots. Love the creative card with the moose!! Love this card! Great job!!! Such a cute, cute card! That moose is adorable!